Trinity Mineral Management assists land and mineral owners in all aspects of oil and gas royalty ownership by creating and nurturing collaborative relationships of professionalism, accountability and care between Trinity, Landowners and Producers. As a provider of professional services, Trinity has managed assets for private landowners, bank trusts and foundations, giving Trinity the knowledge and experience necessary to serve a diverse clientele. Our approach to management varies from the traditional bank and trust model by keeping you in control of decision making and not taking a percentage of your royalty income. Our purpose is to maximize your revenue for your benefit. 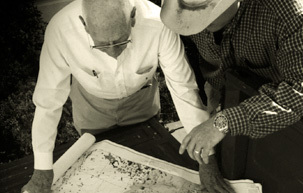 Our team of dedicated professionals has over four decades of land and mineral management experience. We assist in the management of over 1 million acres of land throughout numerous states with reserves exceeding 100 million barrels of oil equivalent. In addition, we have assisted our clients in negotiating over $100 million dollars in lease bonuses, pipeline right of ways, and recovery of unpaid royalties. Trinity assists landowners in all aspects of mineral and royalty ownership to maximize their assets through a highly effective combination of state-of-the art technology and strategic relationships between Trinity, clients, producers and oil & gas industry professionals. The business of leasing private land to oil and gas companies for exploration and production can be complex. While mineral/royalty owners and oil companies are both interested in getting the most from the reserves on the property, negotiating a new lease or assessing whether operators are in compliance with the terms of the lease and paying royalties accordingly can be daunting. Existing leases often need to be re-evaluated as they may be outdated or inconsistent with current standards. Surface use and land reclamation must be negotiated to balance both the rights of the operator and interest of the surface owner. The professionals at Trinity Mineral Management understand that mineral and surface owners can make better decisions with solid information. Trinity believes in an agile management style, that allows adaptation to the ever-changing world of oil and gas, by being proactive rather than reactive. We work with our clients to identify concerns and agree upon a clear objective and scope of work, while at the same time, remaining flexible and nimble to the unforeseen.